Birch Rock Camp for Boys is whizz-bang* for lots of reasons but one phenomenal thing is our long history. Birch Rock was created in the Roaring 20’s — think Babe Ruth, jazz, flappers, the mass production of Ford Model T’s and refrigerators to replace ice boxes. 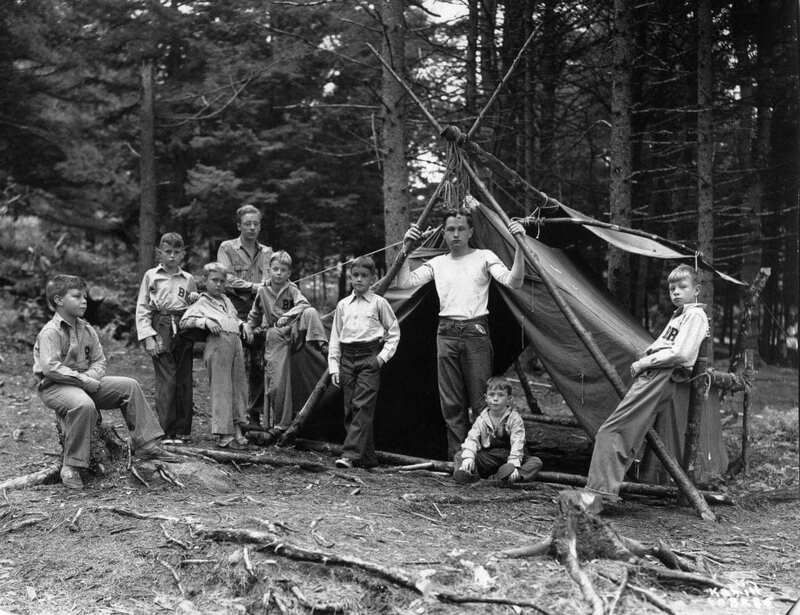 In 1926, Chief and Onie Brewster welcomed the first boys to the Hillside, offering traditional camping skills, camaraderie, and healthy living in the Maine woods. Where did this idea of children leaving home to rough it during the summer come from? And how did the gear needed for camping develop? 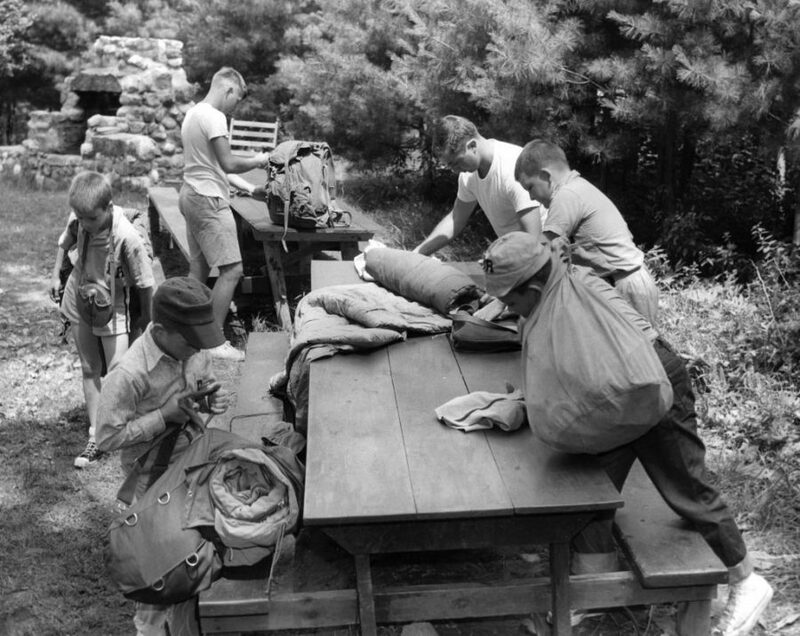 Putting aside human migration and armies on the march— which go back thousands of years— recreational camping got its start in a little town called Washington, Connecticut by Frederick Gunn, who founded a school called The Gunnery. It was the summer of 1861, just a few months after the start of the Civil War. Mr. Gunn set off with a group of students on a two-week trip to introduce them to hiking, fishing, observing nature, and cooking over a campfire. Slowly but surely, word spread of this visionary educator’s outdoor curriculum. Fast forward to 2019— the American Camp Association reports there are about 12,000 summer camps, including sleep-away and day camps, now in existence in this country. The word “backpack” entered our lexicon in 1904, and eight years later people started saying they were “going backpacking.” Credit for the first modern version of this fundamental piece of gear goes to Duluth Pack Company in Minnesota. In 1882, founder Camille Poirier, a French Canadian immigrant, patented the “C. Poirier Pack Sack” with adjustable shoulder straps and buckling straps to secure the contents. (Duluth still makes a pack similar to the original). The modern camping tent was invented by U.S. Army officer Henry Hopkins Sibley and patented in 1856 by the U.S. Patent Office. His bell tent was based on the Native American teepee, with a telescoping central pole supporting the canvas (instead of buffalo hide). Sibley resigned from the U.S. Army in 1861 to join the Confederate States Army. He received no royalties on his patent (his earlier agreement with the U.S. Department of War to receive $5.00 per tent was voided). The Union Army produced 44,000 Sibley tents during the Civil War. Jumping ahead 50 years, the first Boy Scout Handbook is published in 1910 with pictures of 10 types of tents. After WWII ended in 1945, the post-war economic boom sent Americans to Army-Navy surplus stores and camping stores to buy tents and equip themselves for the great outdoors. In 1959, Eureka! introduced the first quick-to-set-up, free-standing tent. Dazzling improvements since then include ultralight poles, high performance fabrics, and remarkable compactness. The air mattress was invented in Reading, Massachusetts in— astonishing but true—1889. Closed cell foam pads were developed in the 1960’s. The first mass-produced sleeping bag was a far cry from the puffy, zippered wonder that campers get their zzz’s in today. In 1876, a Welshman named Pryce Pryce-Jones designed his “Euklisia Rug” and sold 60,000 to the Russian Army. This “innovative” piece of equipment was a wool rug folded in half and fastened together, with a sewn-in inflatable rubber pillow. Woolen uniform, woolen sleeping bag— scratchy misery in a summer rainstorm! In the Second World War, the U.S. Army was issuing mummy-shaped sleeping bags to GI’s, but again they were heavy woolen rolls to lug around (with cotton liners and waterproof shells). Zip ahead to 2019: Mountain Hardware sells a less-than-2-lb. sleeping bag that packs down to the size of a football—yours for only $600. How about jackets to ward off the evening chill? Wool, naturally, was the only choice for eons, but wool has some drawbacks: it takes more care to launder; it’s rougher on the skin, and some people (like me) are even allergic to it! A big breakthrough in 1981— Malden Mills in Massachusetts and Patagonia teamed up to create synthetic polar fleece, called Synchilla. Fleece revolutionized camping wear. The stuff is light and hydrophobic (it holds less than 1% of its weight in water). It’s durable and affordable. Now we can choose to buy fleece made from recycled plastic bottles and recycled polyester. Patagonia developed this eco alternative in 1993. But the company now acknowledges that its synthetic clothes (and all synthetic clothing produced and worn) contribute to microfiber pollution, and addresses ways to mitigate the damage. It may be time to turn back to good quality wool, like SmartWool, for responsible clothing choices, if the itching isn’t unbearable! Have you ever wondered why we call them flashlights and the British call them torches? In 1898, the American Electrical Novelty and Manufacturing Company (later the American Every-Ready Co.) introduced the “electrical hand torch.” Early D batteries were weak, so the light only came on in brief flashes. The nickname “flashlight” stuck for Americans. In 1937, hiking boots were revolutionized by Italian Vitale Bramani, who lost six friends in a mountaineering accident in the Alps. He was convinced that slippery soles on their boots caused the tragedy, and he felt driven to create a new climbing sole. His Vibram rubber lug sole with a distinctive tread design is still widely used today. It is astonishing to think that before Vibram, hikers and climbers wore boots with leather soles, sometimes studded with hobnails or steel cleats. A major rite of passage at Birch Rock is for a camper to earn his “Knife Rights.” He learns the rules of knife safety at camp craft, and after much practice he must demonstrate that he is competent with the tool. A very popular knife at camp is the Leatherman multi-tool. This phenomenally successful tool got its start in a very American place— Tim Leatherman’s garage. Tim was inspired to design a “Boy Scout knife with pliers” while he and his wife traveled in Europe and the Middle East in 1975. He was frustrated having to do car and hotel plumbing repairs himself with a simple pocketknife. Lots of tinkering, years of refining, and in 1983 Leatherman had his first sales— 30,000 PSTs (Pocket Survival Tools). Millions of knives later, they’re still made in Oregon. Ever ponder what people did before sunscreen? They got horrendous sunburns, over and over again. But once more, warfare was the mother of invention. GI’s fighting the Japanese in the Pacific theater were at great risk because of the intense sun. In 1944, Airman Benjamin Green (later a pharmacist) developed a sunblock called “Red Vet Pet” from red veterinary petrolatum. Imagine coating yourself with thick, red Vaseline-like goop. Green kept at it and his big breakthrough in the early 50’s was a product that actually rubbed in and smelled nice (jasmine scented). This sun lotion had the catchy name Coppertone, and sun products were on their way to a multi-billion dollar business. A Swiss chemist named Franz Greiter introduced the system of SPF (sun protection factor) in 1974, and water resistant lotion hit the market in 1977. When a Birch Rocker uses sunscreen and sun-blocking hats and clothes (as encouraged by counselors and camp nurses) he need never feel the misery of a sunburn after a day of fun at camp! Right about now, when the winter seems impossibly long and dark and cold, Birch Rockers find themselves reminiscing about campfires and S’mores, cabin buddies, and the sun glinting on beloved Lake McWain. Soon enough it will be time to get trunks out of the attic and search high and low for all that camp gear. For first-time campers — the most awesome experiences of your lives await!